Mathematicians have mapped the inner workings of one of the most complicated structures ever studied: the object known as the exceptional Lie group E8. This achievement is significant both as an advance in basic knowledge and because of the many connections between E8 and other areas, including string theory and geometry. The magnitude of the calculation is staggering: the answer, if written out in tiny print, would cover an area the size of Manhattan. Mathematicians are known for their solitary work style, but the assault on E8 is part of a large project bringing together 18 mathematicians from the U.S. and Europe for an intensive four-year collaboration. "This is exciting," said Peter Sarnak, Eugene Higgins Professor of Mathematics at Princeton University (not affiliated with the project). "Understanding and classifying the representations of Lie Groups has been critical to understanding phenomena in many different areas of mathematics and science including algebra, geometry, number theory, Physics and Chemistry. This project will be valuable for future mathematicians and scientists." The magnitude of the E8 calculation invites comparison with the Human Genome Project. The human genome, which contains all the genetic information of a cell, is less than a gigabyte in size. The result of the E8 calculation, which contains all the information about E8 and its representations, is 60 gigabytes in size. That is enough space to store 45 days of continuous music in MP3 format. While many scientific projects involve processing large amounts of data, the E8 calculation is very different: the size of the input is comparatively small, but the answer itself is enormous, and very dense. Like the Human Genome Project, these results are just the beginning. According to project leader Jeffrey Adams, "This is basic research which will have many implications, most of which we don't understand yet. Just as the human genome does not instantly give you a new miracle drug, our results are a basic tool which people will use to advance research in other areas." This could have unforeseen implications in mathematics and physics which do not appear for years. According to Hermann Nicolai, a director of the Max Planck Institute in Potsdam, Germany (not affiliated with the project), "This is an impressive achievement. While mathematicians have known for a long time about the beauty and the uniqueness of E8, we physicists have come to appreciate its exceptional role only more recently --- yet, in our attempts to unify gravity with the other fundamental forces into a consistent theory of quantum gravity, we now encounter it at almost every corner! Thus, understanding the inner workings of E8 is not only a great advance for pure mathematics, but may also help physicists in their quest for a unified theory." How big is the answer? The team that produced the E8 calculation began work four years ago. 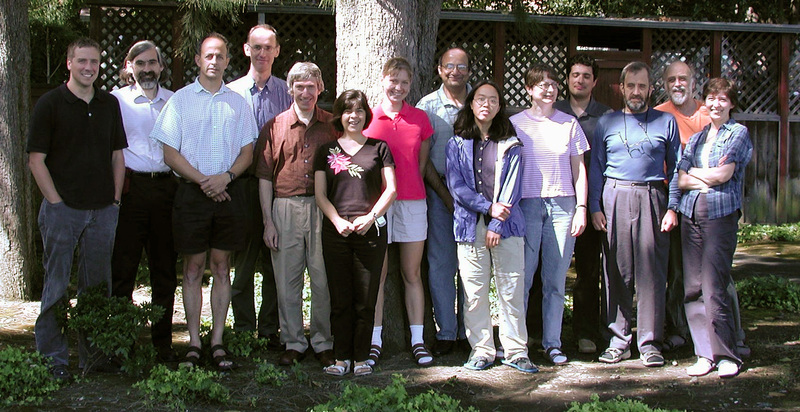 They meet together at the American Institute of Mathematics every summer, and in smaller groups throughout the year. Their work requires a mix of theoretical mathematics and intricate computer programming. According to team member David Vogan from MIT, "The literature on this subject is very dense and very difficult to understand. Even after we understood the underlying mathematics it still took more than two years to implement it on a computer." And then there came the problem of finding a computer large enough to do the calculation. For another year, the team worked to make the calculation more efficient, so that it might fit on existing supercomputers, but it remained just beyond the capacity of the hardware available to them. The team was contemplating the prospect of waiting for a larger computer when Noam Elkies of Harvard pointed out an ingenious way to perform several small versions of the calculation, each producing an incomplete version of the answer. These incomplete answers could be assembled to give the final solution. The cost was having to run the calculation four times, plus the time to combine the answers. In the end the calculation took about 77 hours on the supercomputer Sage. At the most basic level, the E8 calculation is an investigation of symmetry. Mathematicians invented the Lie groups to capture the essence of symmetry: underlying any symmetrical object, such as a sphere, is a Lie group. Lie groups come in families. The classical groups A1, A2, A3, ... B1, B2, B3, ... C1, C2, C3, ... and D1, D2, D3, ... rise like gentle rolling hills towards the horizon. Jutting out of this mathematical landscape are the jagged peaks of the exceptional groups G2, F4, E6, E7 and, towering above them all, E8. 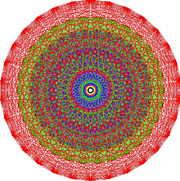 E8 is an extraordinarily complicated group: it is the symmetries of a particular 57-dimensional object, and E8 itself is 248-dimensional! To describe the new result requires one more level of abstraction. The ways that E8 manifests itself as a symmetry group are called representations. The goal is to describe all the possible representations of E8. These representations are extremely complicated, but mathematicians describe them in terms of basic building blocks. The new result is a complete list of these building blocks for the representations of E8, and a precise description of the relations between them, all encoded in a matrix with 205,263,363,600 entries. The E8 calculation is part of an ambitious project known as the Atlas of Lie Groups and Representations. The goal of the Atlas project is to determine the unitary representations of all the Lie groups. This is one of the great unsolved problems of mathematics, dating from the early 20th century. The success of the E8 calculation leaves little doubt that the Atlas team will complete their task. The Atlas team consists of about 20 researchers from the United States and Europe. The core group consists of Jeffrey Adams (University of Maryland), Dan Barbasch (Cornell), John Stembridge (University of Michigan), Peter Trapa (University of Utah) , Marc van Leeuwen (Poitiers), David Vogan (MIT), and (until his death in 2006) Fokko du Cloux (Lyon). The results of the E8 computation were announced in a talk at MIT by David Vogan on Monday, March 19, 2007. The Atlas project is funded by the National Science Foundation through the American Institute of Mathematics. AIM receives major funding from Fry's Electronics and the NSF.